MarketPsych's first digital film installment on the Facebook IPO from our "Bob and Helen" series for financial advisors. Link HERE or click on Red Curtain Above. These words came from my brother, Loring, and their significance was unmistakeable – worlds have collided. My brother is an actor and filmmaker (quite talented too, www.mcquaidbrothers.com, http://twitter.com/loringmurtha). He is about as far removed from the world of investing as one can get. In fact, I suspect he couldn't name more than one holding in his managed portfolio. But when I mentioned to him the other day that “Facebook is having its IPO. IPO stands for Initial Pub-“ he saved me the trouble, cutting me off with the statement above. My brother is not an official MarketPsych Sentiment Indicator. We have REAL ones for that. But he might as well be. It indicates that Facebook's upcoming stock offering is much more than a financial investment. It's a pop-cultural phenomenon - with all that that entails. In a story that is perhaps apocryphal, Bernard Baruch said that he knew it was time to get out of the market (pre-crash) in 1929 when his shoe shine boy gave him a stock tip. In a story that is definitely apocryphal, Baruch also said,"By the time your Mom learns the name of the band, they’re no longer cool." Why? Because it means EVERYBODY knows. Stocks are like "Indie Bands"; part of their appeal is that not EVERYONE is rushing to see them. Facebook's IPO will attract an entirely new class - indeed, perhaps an entirely new generation - to equities investing. By the way, the last time my brother mentioned a stock to me it was Sirius Satellite Radio (SIRI) in 2007. Two years later you could pick up a share of SIRI for a dime. A piece of Bazooka Gum or ownership in the most revolutionary company in radio history? Your choice. Will that be the fate of Facebook? I hardly think so. But as MarketPsych has long (and correctly) maintained, all stocks prices are the product of the aggregate psychology of the investing community. 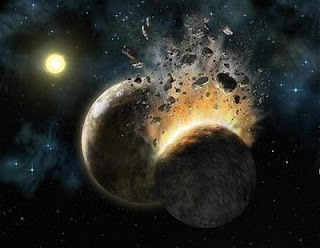 What happens to that community when Worlds Collide? When the peaceful, orderly state of Financia is suddenly flooded with wild refugees from the nation of Facebookistan? Strange, often tragic things happen when worlds collide. Just ask Independent George. I didn’t say unpredictable. Just strange. My MarketPsych colleague and resident genius, Dr. Richard Peterson has created www.MarketPsychData.com to provide uncanny predictions utilizing social media analytics for just this sort of thing. Ironic, don't you think? Using social media to forecast social media stocks? Worlds colliding, my friends. Worlds colliding. I tried to close my Facebook account once. Somehow I continued to receive “Friend” notifications in my email. So I tried to close my account again. The notifications still came. After the fourth attempted account closing, and more Facebook emails, I set up Facebook-to-trash email filter. But I’m the exception, Facebook is generally well-liked. Facebook has a user population of 845 million - ranking it as the world’s third largest country (if it were a country). Apparently it got that population with some socially manipulative tactics such as emails titled “You have friends waiting” – subtext: “What kind of person are you to keep friends waiting?”). And that’s not to mention their North Korea-style user retention policies. In addition to our usual haunts of New York and Los Angeles, we will be speaking in Chicago and the San Francisco Bay Area in February – we’re look forward to catching up with our friends in those cities! Next week we have 2 coaching schedule openings on February 9th at 1pm ET and at 4pm ET - if you’re interested in one of those coaching appointments, please reply “coaching” to this email to reserve. Have you ever felt like you had to have something – like really must get some of it for yourself? In honor of investors excited about the Facebook IPO (and their beleaguered financial advisors), Dr. Murtha created this terrific short video spoof of an investor discussing the "The Facebook" IPO with his financial advisor. This fear of missing out is the feeling that promoters of IPOs work hard to instill. IPO excitement, seasoned with a dash of fear of not being involved, leads to increased demand for shares, higher investor risk-taking, and of course, a higher opening IPO price. On the positive side, academic studies show that IPOs were underpriced an average of 22% from 1965 to 2005, which is good for those on the inside – those who get the initial share allocation. But the feeling of excitement engendered by IPO promoters (and often the media) drives many investors to jump into shares in the public market, typically on the first day of trading, where emotional reactions to volatility damage their returns. This data and graphics showing trader performance in Groupon (GRPN), LinkedIn (LNKD), and Pandora (P) shares on their first day illustrates the problem. Since these three IPOs in 2011, first day buy-and-hold investors have lost about 20% on average through the end of 2011. IPO excitement inspires rationalizations: “this time it’s different” (overconfidence) and “if I don’t buy now, I may never get it at this price again” (scarcity). This is not to disparage Facebook as a company. Facebook is riding the crest of a revolution in communication, community-building, and social prediction. And with their enormous trove of data, they are sitting on very valuable insights. Fortunately for the financial industry, the excitement surrounding Facebook is likely to rekindle individual investor interest in the stock market, and it may be one factor that drives a nice rally in the stock market this year (in tandem with a year-long real estate bounce and certainty about low interest rates). "The Extraordinary Popular Delusion of Bubble Spotting." November 5, 2011. Jason Zweig. Wall Street Journal. "Women Make Better Investors Than Men, But Why?" November 28, 2011. Ted Schwartz. ABCNews.com. November 26, 2011. Ben Levisohn. WSJ.com. "Bull Market Bear Market Bring It On!" WSJ.com. October 15, 2011. Ben Levisohn. 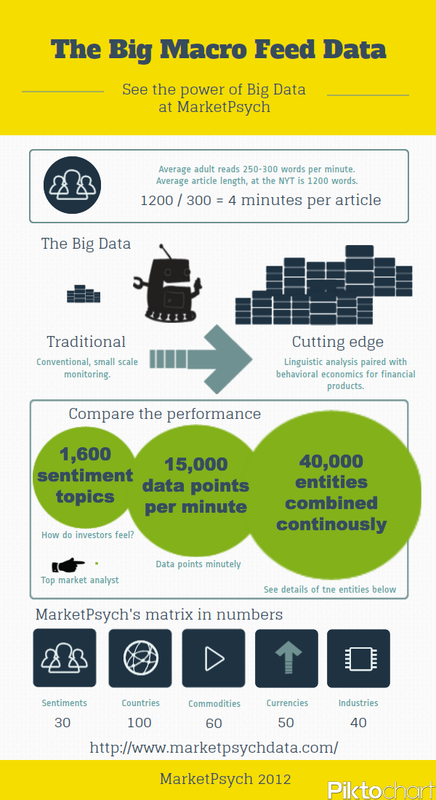 At MarketPsych we are at the vanguard of social prediction in the financial industry. We developed predictive models that not only are monitoring the buzz about Facebook, but that use the characteristics of that buzz to predict (and trade) Facebook’s shares. We have spent decades modeling social data and trading on it - our MarketPsy Long-Short Fund LP was successful in using this data to outperform the S&P 500 by 27% from launch on September 2, 2008 to the end of 2010 (when we closed it). It’s not only our firm that does this - there is an entire industry of social prediction based on mining behavioral and psychological data. Predictive analytics is occurring in every industry. One company - from whom I recently received a “we will hire anyone with a pulse who has statistical skills”-type email - Accretive Health (NYSE: AH) reports mining 1 billion health insurance claims in order to identify trends that can be arbitraged to reduce health care costs while increasing health care delivery. But this newsletter isn’t about Big Data companies per se, it’s about social prediction and how we can do better in our own decision making using the insights we are gleaning from social data. More about Big Data generally can be read in this McKinsey study and here is a great summary of companies in this space on Quora. While it appears cutting edge, it turns out that social prediction using big data is old news. The other day, after the fifth person in a week told me, “sounds like your data is recreating Isaac Asimov’s Psychohistory,” I decided it was time to investigate. Now I’m not exactly a science fiction fan, but I do enjoy a good story regardless of whether it occurs in our solar system or Qo'noS. In high school I occasionally wrote book reports on science fiction novels (lenient teachers!). But it was largely a matter of finding Jane Austen a bit too stuffy , not a personal fascination with the other-wordly (Prime Radiant? Psionic Suppressions? ), that drove such reading. So today in Wikipedia I read, “Psychohistory is a fictional science in Isaac Asimov's Foundation universe which combines history, sociology, and mathematical statistics to make general predictions about the future behavior of very large groups of people, such as the Galactic Empire.” Cut off the Galactic Empire bit, and that is EXACTLY what we’re doing at MarketPsych. Go figure. I guess we’ll have to withdraw our “Universal People Prediction Device” patent application – Asimov beat us to it. In addition to economic sectors, stocks, and commodities, few people know that we also monitor social and psychological phenomena by location - cities and countries. For example we have indices of “Social Unrest” related to negative chatter about national governments, authorities, and business leaders in social media. It’s likely this data will prove to be predictive of social events, although we may not have enough unrest incidents (thankfully) to test it thoroughly. Per an informed source, China experienced 160,000 significant social protest actions last year (from tens to hundreds of thousands of citizens participating). Many of these actions could be (briefly) detected in social media, but they were not revealed in news media due to Chinese government concern about social stability. As a result we are not only tracking news media unrest mentions (since these are censored), but perhaps more importantly, we pick up on psychological predictors of unrest in social media. Such predictors include expressions of anger and frustration towards authorities and mentions of personal hopelessness (a positive predictor of impulsive violence). While social unrest is related to social forces often out of our immediate control, we can gain control how we prepare for and manage ourselves when experiencing setbacks if we understand our propensities to reaction. Genetic and hardwired cognitive biases play a role in our responses to loss, as you can see in today’s Researcher’s Corner, but such factors are by no means deterministic. We can intelligently use our minds to make better decisions. The authors took genetic samples from 60 Wall Street traders in 2008 before the market meltdown. They found that traders with genes conferring moderate dopamine tone were more likely to have longer careers as traders. The longetivity of traders (the study’s dependent variable) was correlated with fewer D4 receptors and also less catabolic (enzymatic breakdown) of dopamine, theoretically leading to higher tonic levels of dopamine and less variability per receptor over time. This dopamine environment might lead to more stability during the ups and downs of trading and should be correlated with behaviors such as less trading in volatile markets (which the authors found) and perhaps more emotional and analytical equilibrium. The authors conclude: “Combining the personality analyses and genetic findings from the present study, reveals that our sample of traders are analytical, integrative, and can delay gratification. They have a genetic profile associated with balanced levels of dopamine.” As we gather more data we may see additional interesting results. Last Friday I attended a talk by one of my academic heroes – Harvard GSB professor Max Bazerman – on the subtle cognitive biases that underlie unethical behavior. He has a new book out called Blind Spots which is a fascinating account of his research. Bazerman introduced the topic by explaining that MBA students are taught ethics through case studies that profile high-impact criminal behavior, yet the vast majority of unethical behavior is not obvious or dramatic at first. It is subtle, gradual (slippery slope), and permitted to some degree by observing others. As he points out, the standard MBA ethics education – which focuses on high-profile criminal cases, but not common unethical behavior - is inadequate. In some ways Bazerman’s research gets at the underlying causes of the financial crisis and contributes to our understanding of why no one has been criminally convicted. Bazerman provided behavioral evidence of such socially important biases as 1) The unethical practices of auditors - by which independent auditors are blinded by their desire for ongoing income into gradually “cooking the books” of their clients, 2) The slippery slope by which most unethical behavior progresses, as our minds gradually rationalize misbehavior, 3) The process by which observers will permit minor unethical behavior with no compensation or kickbacks at first, ultimately putting themselves in a bind as serious violations mount and they feel unable to speak up after a history of silence, 4) How people judge ethical violations as less “bad” than ethically proper behavior that ends with worse result, 5) People judge anything that personally benefits them as less unethical, 6) Losses accelerate unethical behavior – similar to the disposition effect – in which people are also more likely to break the rules to get back to even, 7) And amazingly to me, people judge others hiring a proxy to do their ”dirty work” as significantly less unethical than doing the dirty work oneself. Some of these biases explain, in part, why rogue traders begin and can escalate their misdeeds – collaborators looking away with good results (at first) lubricating further off-the-books trades, a slippery slope of small accumulating losses accrues, and losses accelerate unethical rule-breaking (disposition effect), and finally the climactic blow-up occurs. The same process explains the social, financial, and government biases that gradually allowed the housing bubble and bank risk-taking to grow to huge proportions. As Bazerman points out, simple self-awareness only slightly ameliorates most cognitive biases. Per Bazerman the best (and only proven) solution to such biases is to reform institutions to help us be less harmed by our biases – the “Nudge” example of Richard Thaler. I would add that 1) learning about the nature of biases and 2) gaining specific self-awareness of biased decisions - by working through bias examples in one’s own decision making including practicing alternative decision strategies – also appears to reduce biasing. Given what we’ve learned above – that IPOs lure naïve investors in due to hype and fear, that big data and social prediction is altering our future trajectory, that researchers have identified that moderate tonic dopamine levels can prevent us for falling for such hype and volatility as that around IPOs (and thus be better investors), and that our biases and Blind Spots are prevalent and explain some social trends and events like the financial crisis. The result of all this data and new understanding is a science of prediction (once called PsychoHistory by Isaac Asimov). Given all this, what are we as investors to do? Based on emerging evidence of the role of genetics and hardwired biases influencing decision making and performance, in combination with awareness (always a first step), external behavioral “nudges” are the best tools we have for setting up an optimal bias-lite decision environment. Secondly is practicing self-awareness and working through biases in one’s own decision making (at MarketPsych we have developed workbooks for this practice). For financial advisors one application relates to their increasingly common role as an emotional coach for their clients. Advisors often need a nudge to engage with clients when they themselves are feeling beleaguered by falling markets. Advisors can set up their daily routine to incorporate simple tricks like seeing clients in the mornings or have interactions scheduled after refreshing activities like exercise or enjoyable activities. (We have many more ideas for advisors – contact us for more information). We will be speaking in the San Francisco Bay Area next week (two classes at Stanford and two progressive corporations) as well as in New York at a Risk Management conference and in Chicago in February 2012. Contact us if you’d like to attend or you are in one of those cities and would like to meet. We also have speaking and training availability for your firm or organization in late April. Please contact Dr. Peterson or Dr. Murtha for more information. MarketPsych Data provides granular quantitative sentiment data from streaming social and news media through a major news partner. Please contact us for data access and more information.